Northern Australia is characterised by diverse topography, from forests, lagoons, rivers, mangroves, flood plains, rocky escarpments, coastline and islands. One of the most remarkable and substantial features is Arnhem Land, which is located in the Northern Territory bounded on the west by Kakadu National Park, the north by the Arafura Sea, the east by the Gulf of Carpentaria and in the south by the Roper River. It is a vast area covering nearly 100,000 square kilometres. Physically, Arnhem Land is comprised of a spectacular plateau which is penetrated by freshwater rivers, dotted with waterlily strewn billabongs, rocky outcrops, patches of dense woodland, plains of spear grass and lowlands which are subject to radical transformation during the wet season. product is released under the Creative Commons Attribution 3.0 Australia Licence. Language groups across Arnhem Land are diverse and include Bininj Kunwok, the language group of West Arnhem Land and the predominant dialect Kuninjku (eastern Kunwinjku) to the west. The language groups of Central and Eastern Arnhem Land comprise Rembarrnga; Gumatj, Rirratjingu, Djapu, Manggalili, Marrakulu, Madarrpa, Galpu, Dhalwangu, Dätiwuy, Ngaymil, Djarrwark, Munyuku, Djambarrpuyngu, Wangurri, Dhudi-Djapu and Gupapuyngu. 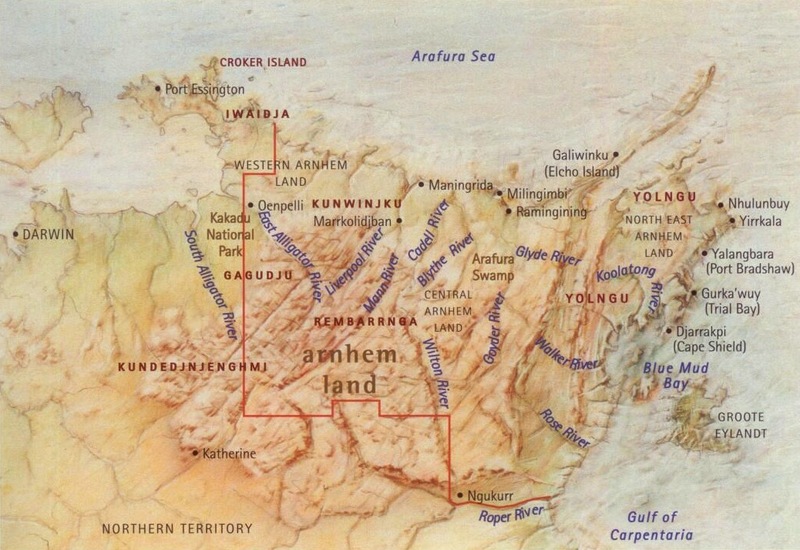 Historically, Arnhem Land was roughly divided into three sections, Western, Central and Eastern. An imaginary line drawn from just west of Maningrida directly south to, and over, the Wilton River and then running west between Pine Creek and Katherine, sets out Western Arnhem Land, while a line west of Elcho Island running south, east of Donydji to Blue Mud Bay, Gulf of Carpentaria, identifies Central Arnhem Land and reveals Eastern Arnhem Land as rather like a peninsula. Yet, Helen Groger-Wurm in her volume Australian Aboriginal Bark Paintings and their Mythological Interpretation, 1973, sites Arnhem Land into a small Western Arnhem Land and a substantial large Eastern Arnhem Land.1 However, today these subdivisions are not strictly adhered to, particularly due to the complexity of linguistic and cultural groups. While Western Arnhem Land and Eastern Arnhem Land culturally and linguistically are clear, Central Arnhem Land has a higher density and mix of linguistic and cultural groups centred around Maningrida. The communities of Western Arnhem Land are generally considered to be Gunbalanya (Oenpelli) Jaruluk (Beswick), Bamyili and Katherine. The Roper River originates near the Stuart Highway flowing to the Gulf of Carpentaria along the southern boundary of Arnhem Land. As the Roper River snakes its way towards the Gulf, it snuggles against the tiny community of Ngukurr, a former Anglican mission which is located on hilly ground overlooking the river. Ngukurr was established early in the 1900s on the north side of the Roper while the only access road was on the south side, resulting in the community being isolated during the wet season months. Access during the Wet season, today is only by air or boat from Roper Bar. Many of the southeast Arnhem clans living at Ngukurr, have traditional country to the south of the Roper. During the dry, Ngukurr is accessible by road from Katherine and Darwin. The numerous clans from the surrounding region include seven language groups, the Mara, Ngandi, Alawa, Nunggubuyu, Rittarrngu, Wandarang and Ngalakan. Ayangkulyumuda (Groote Eylandt) is renown for the exquisite bark painting of suspended subjects, such as Dinungkwulanguwa (dugong)2, set against an iconic black manganese background created with a delicate combination of red, yellow and white executed through dashes, dots and lines. 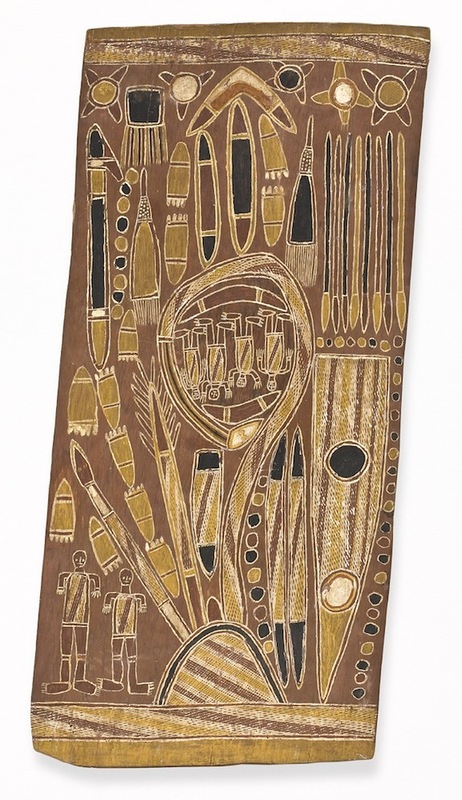 Image: MUNGURRAWUY YUNUPINGU c.1907-1979, Macassan Traders, 1968, natural pigments on bark, © the artist, courtesy Buku-Larrnggay Mulka Centre. Milingimbi, an island located approximately 500 kilometres east of Darwin and 250 kilometres west of Nhulunbuy, is approximately half a kilometre off the mainland and forms part of the Crocodile Island Group. A Methodist Overseas Mission was established there in 1923. The two main languages are Gupapuynu and Djambarrpuynu, and English is a second language for most Aboriginal residents. It is the birthplace of noted didjeridu maker and player Djalu Gurruwiwi. Milingimbi is probably Djinan in origin from Milininbi, literally ‘the place where the well is’. The original owners were Yan-nhanu speaking clans. There have been many outside influences of Arnhem Land culture, in the form of Balanda4 settlement and, prior to this, communication with the Macassan5 fisherman from the southern tip of Sulawesi. The Macassans traded with Aboriginal groups across the top end, particularly in eastern Arnhem Land. Historically, the Macassans came south on the northwest monsoon winds in December, to collect trepang (beche-de-mer), a sea slug, which they dried and traded with the Chinese, returning home to Indonesia in March and April on the southeast trade winds. It is thought that the trading commenced sometime between 1100 and 1600. The relation between the Yolngu6 and Macassans, particularly in eastern Arnhem Land, resulted in the Yolngu incorporating the Macassans into their kinship and cosmology. 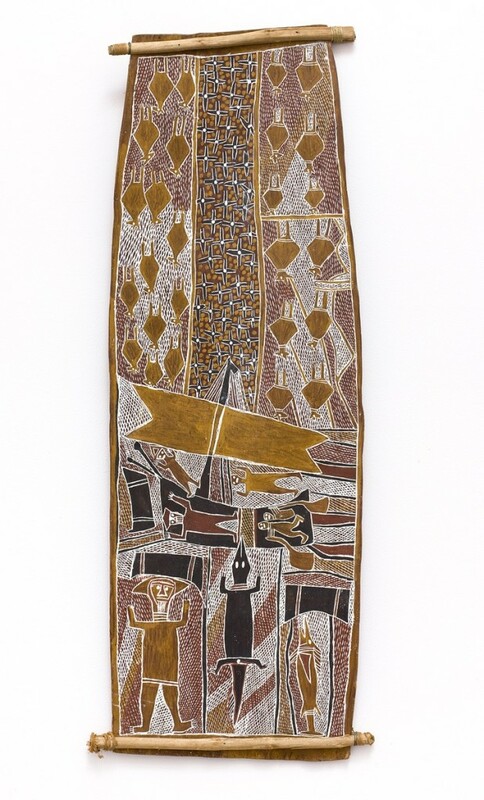 This relationship was to cease in 1906, prohibited by the Australian Government Immigration Act, but is still celebrated through bark painting such as Sam Baramba Wurramara ‘s Macassan prau in the Art Gallery of New South Wales. The next influence was that of the missionaries lead by the Methodist Overseas Mission, establishing in 1916, the early mission stations at Warruwi (Goulburn Island); Minjilang, Croker Island in 1941; Maningrida in 1957; Milingimbi mission in central Arnhem Land in 1923; Yirrkala in 1935; and then Galiwin’ku, Elcho Island in 1942. A mission was formed at Gunbalanya, the site of Paddy Cahill’s8 pastoral lease, and later a mission was established at Umbakumba on Ayangkulyumuda, (Groote Eylandt) in 1958 for the local Warnindilyakwa people. Missions provided a central location for the various clan groups encouraged by the availability of food and medicine. Missions also support the production of art for the small, but growing industry. However, the Catholic Mission, established in 1935 at Wadeye (Port Keats) implemented restrictions in regard to cultural practice. The bark paintings of the Wadeye region, feature broad fields of ochre, which were accentuated by a perimeter of white dots containing figuration, resulting in the open landscape that is particular to style of this region. In 1931, Arnhem Land was declared a reserve for Aboriginal people. Towns and service centres grew from original government settlements and mission stations. During 1962-3, the senior clan leaders of the Yirritja and Dhuwa moieties9 of Eastern Arnhem Land were each responsible for the creation of a substantial panel to show the descent of contemporary Yolngu10 from the Ancient Beings; each panel to be installed on either side of the cross in the new Methodist Mission church at Yirrkala. Certainly amongst the most important art works produced in Australia, these barks, known as the Church Panels were an affirmation that there were no inherent incompatibilities between Christian and Yolngu beliefs. However, in the 1970s, a new minister viewed them as dangerously heathen and they were removed and stored in a shed. They are now displayed in a special room at Buku Larrgay Mulka Centre at Yirrkala. Despite the 1931 Act returning Arnhem Land to Aboriginal people, and the lack of dialogue with the local people, the Federal Government excised an area of land around the Mission at Yirrkala, for a French company to mine bauxite. The Yolngu response, a petition in two parts representing both the Dhuwa and Yirritja moieties, consisting of a respectfully and directly worded document written in both English and a Yolngu language addressed to the Federal Parliament, was historic. Known as the Bark Petition, these two barks remain on pubic display at Parliament House and have been described as Australia’s Magna Carta. With the passage of the Aboriginal Land Rights Act in 1976, there was an exodus from mission and government centres such as Maningrida, to outstations within the Aboriginal peoples ‘homelands’. In Western Arnhem Land, in the more recent examples, paintings have been attributed to Najombolmi, and to his relatives who all have followed the stylistic traditions of their predecessors. These particular images depict many precise anatomical features of animal and human which include back bone and the long bones, internal organs such as the lungs, heart, liver and kidneys; human tissue including fat, muscles and flesh; body cavities and fluids. Contrary to popular opinion, colours were not restricted to the basic ochres, with purple, pink, orange and blue being evident. A varied form of stick figures also feature in rock painting, which were static or alternatively, in rather expressive poses suggesting action. In some areas there are complex groups including warfare like postures with figures holding spears and appearing to throw spears. Some figures however, were depicted in domestic, ceremonial and hunting scenes appearing more casual. 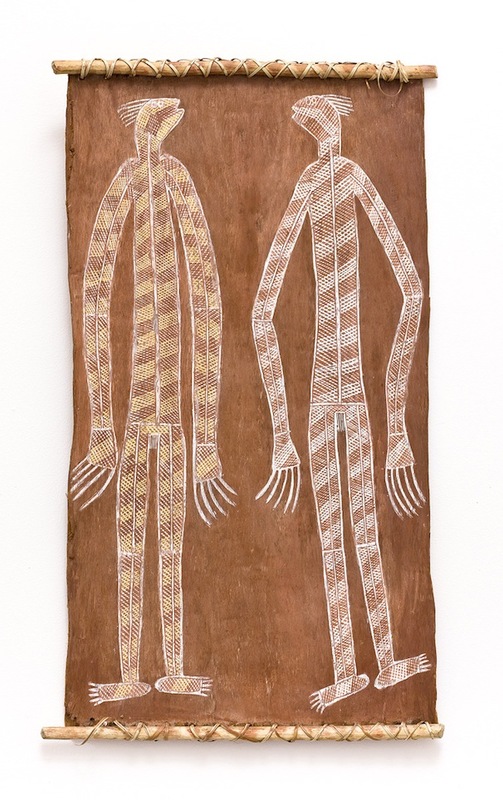 Image: DJAWIDA NADJONGORLE 1943 –, Mimih Spirits c.1972, natural pigments on bark, © the artist, courtesy Injalak Art Centre. mimih which are tall, thin figures who inhabited the sandstone country, easily able to slip in and out of the cracks in the rocks. While the image has been recreated onto bark, Crusoe Guningbal (also Kuningbal) is the first artist to create the mimih in a nonceremonial sculptured form, with a commercial market in mind. Many of the rock paintings of animals such as kangaroos and fish, appear to have been executed after hunting and fishing, rather than painted before as hunting magic. Often animal paintings were used to instruct and pass on traditional practices and beliefs. Arnhem Land is particularly known for its bark paintings. The bark is cut and then peeled from trees during or at the end of the wet season, when the sap rises up the tree ensuring the bark is flexible. It is flattened, placed over coals of a fire to steam out the moisture, then laid out in the sun weighted down with stones to dry. After this, the inner surface is rubbed smooth and the outer charred material removed. Traditionally earth ochres and binder, usually orchid juice, mixed together on a stone were applied with sticks, reeds and brushes made from hair, some as thin as only a few strands. Today, wood glue may be used as a binder with commercial brushes to apply the ochre. It is difficult to date the practice of painting on bark as it is not a permanent form like rock art. Painting on bark for an economic art market expanded in the late 1950s and again in the 1970s. However, bark painting has enjoyed a tradition in many parts of the continent, with the first account dating from a French discovery voyage between 1800 and 1804, at Maria Island, Tasmania.12 There are a number of other Tasmanian accounts of bark shelters adorned with drawings, dating from the early 1880s. Unfortunately, none of these have survived. It is also known that painting on bark was practised in Victoria and New South Wales, and barks have been collected in the Kimberley. However, it is in Arnhem Land and adjacent islands that bark painting flourished and where the art form continues uninterrupted to contemporary times. Bark paintings from Western Arnhem Land tend towards more naturalistic images, often on a plain red background and follows the x-ray and mimih styles of rock painting; while the east makes more use of geometric patterning, especially cross hatching (rarrk), which is believed to be strongly connected to body paint designs. 13 The striking feature of the Eastern Arnhem Land style, is the intricate compositions of figures placed within a refined patterned background. Blank spaces are not aesthetically pleasing to these artists. The Yolngu of Eastern Arnhem Land, reflect in their painting, the creative activities of the Spiritual Beings who created their universe in its full breadth – the sea, land, flora, fauna and humanity. Essentially, Yolngu art is religious, as it is linked to the Wangarr (the Ancestral past) and forms part of ritual activities. The Ancestral Beings were the first to create paintings and passed on the activity to the human beings, the next inhabitants of the land. Frequently the imagery or design evolved as a result of an Ancestral event. Examples of this include the diamond design which the Mardarpa clan use, particularly in regard to Bara, the crocodile. It is said that the design represents the pattern on Bara’s back, which came about by his burning bark shelter collapsing on him. The Yolngu believe that in re-creating these sacred designs, they are securing a part of the Dreaming. The geometric design has ownership of particular places and or events that have taken place, revealing how happenings shaped and explained the world and its geographic features. It is usual that the design will identify the particular clan, perhaps the painter and a certain area of land. Painting is the medium to both transmit religious knowledge and to transfer spiritual power on a generational basis. Painting is part of the continuing of Ancestral practices and the nature of the painting will reflect the significance of the person and the purpose of the ceremony. Significant ceremonies include circumcision and death, especially if the individual has been a powerful person. Two of the most celebrated creation stories are that of the Djang ‘kawu creators and the Wagilag Sisters, both of great significance to the Dhuwa Moiety. The Djang ‘kawu, owned by the coastal clans, concerns the saga of two sisters and a brother, birth, their cultural values and characteristics. Image: DAWIDI DJULWAK 1921 -1970, Wagilag Sisters, natural pigments on bark, © the artist Courtesy Bula ‘Bula Arts. In essence, the Wagilag Sisters is a narrative that accounts for the first encounter of human and animal ancestors. It deals with many key aspects of Yolngu social life and the accompanying rituals, which are expressed in ceremony and through the laws pertaining to authority, kinship, marriage and territory. Anthropologists have played a significant role both through their activities, especially within Eastern Arnhem Land and as collectors of important bark paintings and sculptures. Ronald and Catherine Berndt worked at Milingimbi and Yirrkala immediately post war, and were followed in 1948 by Charles P. Mountford and the AmericanAustralian Scientific Expedition, which visited Gunbalanya (Oenpelli), Milingimbi, Yirrkala and Groote Island. From 1965 to 1970, Helen Groger-Wurm from the Aboriginal Institute of Aboriginal Studies, undertook field work in Arnhem Land. The Association of Northern Kimberley Australian Aboriginal Artists (ANKAAA, established in 1987) maintains its function to foster the Aboriginal arts industry for the benefit of Aboriginal owned and controlled community arts and crafts organisations and by 2009 represented over 2,500 artists from the Tiwi Island, Darwin, Katherine, the Kimberley and Arnhem Land regions. Aboriginal News, 3, no 1, Feb 1976.